If you run your own web server, your log will soon fill up with literally thousands of hits, each taking one line of the log file. We all know that you can use 'wc' (word count) from the command line to see how many lines there are in the file and even hovering the mouse over the file icon in Konqueror will tell you how many lines there are. However, these lines include png files, jpegs and other files so how do we tell how many pages have been downloaded? The 'grep' command will look at each line in a file and attempt to match a pattern with it. If that match is successful, it outputs that line. All you have to do is find some pattern for it to match. In the log file, each record starts off with an IP address, then some more fields followed by the file that the client has asked for, in the form of 'GET /some/directories/yourfile.html HTTP/1.1' (or /1.0). The string that they all have in common is '.html HTTP1.' so if you use that as your matching string, you will get page after page of lines from your log file. ... and use that for further examination. In this way, you can extract data that allows you to trace a visitor through your website, seeing how long they took between loading each web page and so on. Like many other OSes, date and time information is stored on Linux and UNIX file systems for each file, directory, pipe, link and so on. The information you get back tells you about the file itself (type, where it is and how big it is, along with who owns it and how it is controlled) and then you get the three date/times. Change - the time the inode (permissions, ownership) was changed - effectively the metadata. No creation time though. But then, if you really needed that information, you would have it somewhere else, wouldn't you? right - OpenSolaris (time is (apparently) to the nano second although you must remember that this is system time rather than GMT). chmod changes the metadata only. Different OSes have different representations of the hardware they are connected to. On a Windows system, the serial ports have names like COM1: and COM2: but if you are writing a program that looks for them on a UNIX-like OS, you need to know what to call them. Note that in Linux and OpenBSD, you can list a number of serial ports that you can write to whereas in OpenSolaris, you will only see those that actually exist. Not all browsers render your pages in the same way so it is helpful to be able to differentiate between browser types. Things were pretty bad in the browser wars of the late 20th century but even now, with browsers moving towards common standards, you still need to know that browser 'A' will display a table the way you want it to whereas browser 'B' will mess it up completely. You can use the browser's user agent string to set a variable in Apache's httpd.conf file or as here, you can do the same thing in the web pages themselves. One advantage of doing it this way is that the code is transferable so you can take it from one server to another without having to edit configuration files. In your web page, simply include the following lines of code, substituting whatever you need. If, say, you want to supply an image as a gif because png transparency isn't rendered properly then this structure is what you would use. If you are using SSI web parts to define pages then this can be placed in any of the files making everything from background colours to copyright notices configurable. Of course, you don't have to look for MSIE, or even at the user agent, there are plenty of variables that tell you something you need to know. All operating systems like to be the only one on a particular machine but most OS manufacturers are realising that the PC that has their OS on it should be able to use others as well. This, inevitably means multiple partitions, potentially on multiple drives. For somebody not used to the different ways that OSes report partitions and drives, installing OpenSolaris was something of a nightmare because the next to last thing you want to do is overwrite an existing OS installation - the last thing being reading the instructions. However, instead of being presented with a list of partitions with frightening descriptions like 'c2t0d0', you get a friendly dialogue box showing you the drives you have and the options that you want to see instead when you install an OS. After that, it all goes smoothly. Many image file formats are inaccessible from the programs you write without having to rely upon a special module that somebody else has written. This opens up questions about cross-platform compatibility for your program. However, XPM - like one or two other image formats - is just a flat text file that you can write from any program. The start of the file contains information regarding the dimensions (160 pixels wide by 38 pixels high), number of colours used (64) and the number of characters used to describe each pixel (1). ...like so. This is displayed in an ordinary text editor and as the file is ASCII-only, you can edit the text in the XPM file and then save it without having to use a special plug-in or risk losing any of your data. You can see here that the top of the 's' looks like the output from ASCII-art except that here, the characters that have been chosen only represent logical value for the image rendering program to evaluate. If you wanted to change it into ASCII-art, you would need to use 'tr///' in Perl. Similar file formats include PNM and if you want to convert the image to something that an older web browser might know what to do with, there are a myriad of conversion programs that are part of the system so if you open up a Bash prompt and type 'pnmto' and press [Tab] twice, you will see the utilities such as 'pnmtojpeg' and so on. People always want to have a website built for them which, of course, means that you end up doing the hard work. However creating a site that won't break with: font; font-size; and browser width changes is no mean feat - either that or be stuck with a site that only works if it is exactly 994 pixels across. So, here, we have a site that is extremely easy to configure and yet bullet-proof*. It works with any font, is completely resizeable and easy to configure. Above-right, you can see it in a reasonably-sized window with a reasonably-sized font - all of these screenshots are half their original size. Making the page ridiculously wide doesn't break it either (as long as if you are running IE, you have enough text on at least one line of the page). ...nor does making it ridiculously large. So, how do we make a website that has pages that are easy to edit and will resist almost everything we do to them? You can see in the listing on the right that the site has a certain amount of structure to it. parts - the files that the SSI parts refer to. Note that each directory has its own 'index.html' file which contains little more than the name of the directory that it is in - this stops browsers and spiders sending requests that produce lists of files that spiders can use. At the bottom of the listing, you can see that there is one explicit html file (index.html) - this calling the other resources that it needs by using SSIs. ...with the meta information and the identities and locations of the favourite icon files in the file 'parts/meta.chich' and the title tag and the page-common title (ie 'Bill's Site :: ' or 'space blog :: ') in it. After that line, we have 'Home' which is the title of this particular page and you would change that for other pages. which would look like 'Bill's Site :: Home on the title bar. In this way, you can insert the text and images - and any other structures you want - into the home page and save it. To create another page, copy the index.html.master file to weddings.html or whatever you want, edit the menuitems file in 'parts' so that you have a link to it in all of the pages and then add its content. The menuitems web-part is called by all of the pages so updating it will update all of the pages. This is the same with all of the parts and if you find that you are using a structure repeatedly, you can extract it to parts and call them so that they are globally editable. The basic configuration involves deciding on a logo and the colours of your title background and coloured text. One way to find the right colours for your site is to look at some sites that you like the colour schemes for and takes samples of some colours. In The GIMP, you can click on the foreground/background colour in the toolbox and the dialogue box on the right pops up. You can either select a colour using the colour space on the left (you can see five tabs across the top which give you five ways of selecting colours) or the sliders on the right. 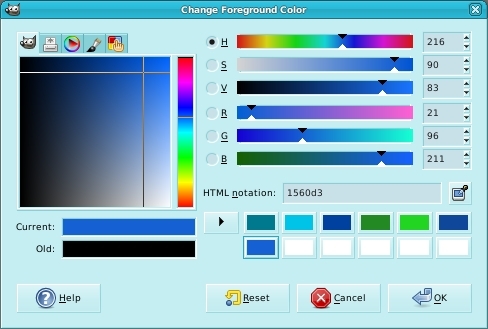 Alternatively, you can click on the eyedropper which will let you select any colour on any part of the screen (not just an image already loaded - this is on The GIMP 2.4.1, you might have to take a screenshot and sample that using the eyedropper tool on some older versions of The GIMP). Once you have finished, you will see that you have a six-digit hexadecimal representation of the colour ('HTML notation:' in the screenshot above) and you can copy and paste that into your colour tag files. Next, save a 16x16 and 32x32 version of your favicon in the icons directory (you can use any browser-friendly format you like so .PNG files are all right) and the logo in the images/graphics directory and then, in the parts directory, you can edit the other files that define colours, text and so on. To add a new page, copy the master file in the document root directory then give it a new name and add the page content. To add it to the menu, edit the 'menuitems' file in the parts directory. The readme.txt file contains a list of web parts and what they do. Making pages now just consists of copying and pasting text, producing links for images and updating the menuitems file. The interesting thing about this approach is that each page in the document root refers to the web parts in the parts directory so when you update the menuitems file, the menu is automatically update on all of the pages. The same goes for the colours, logo, site tag and so on. This allows your server to look at the .html files without you having to use the X-Bit hack (such as on version of Apache that don't use that hack or on OSes that don't support an executable attribute in the metadata such as on Windows. And, that's it. You can get to the files by clicking on the link on the left, copy them onto your system and have a play around. If you want to see what a particular table does, change the border value to '1' or '2' to make it show up. 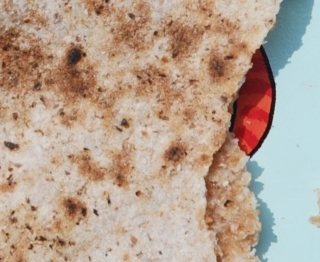 Back in the olden days, we used to make punched cards out of pretty much anything, including chapatties (apparently). Image processors are getting fairly advanced and can produce their own textures for you to use either as a visible surface or for a bump map to be rendered. However, no matter how good these are, if they take up a dominant role in the image, they tend to look artificial. An alternative to this is to use real textures such as that used in the image on the right. Armed with a camera with a reasonable macro provision (many compact cameras have better macro capabilities than the standard lens in the macro position on SLRs costing ten times as much), you can take whatever textures you like. 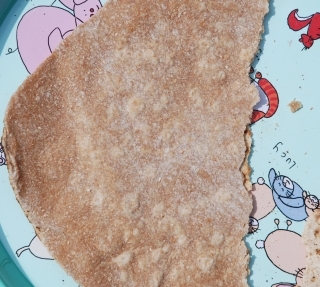 The image on the right is from a chapatti (roti) that I made and then thought that it would be interesting to have as the substrate for this month's SuperDisc punched card. As an example of what you can do on your own, as opposed to buying images that someone else has taken and then has inevitably created licensing issues about, here is how it was done. First of all, you need to make/obtain whatever it is that you are going to use. 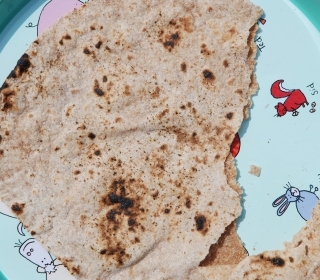 To make roti, make a stiff dough from just water and wholemeal flour then roll it into balls around 1.5" (4cm) in diameter. On a lightly-floured surface, one at a time, roll them flat until they are around 8 to 10" (20 - 25cm) in diameter. Then, on a skillet that is hot enough to make a pinch of dry flour start to brown within 10 seconds, place the freshly rolled roti and let it cook for what seems like around 20 seconds. This cooks a thin layer. Turn it and let it cook on the other side until it starts to go a bit bubbly (like in the picture on the top-right). Turn it back onto its original side and then, holding it still with a pair of long tongues, pull the skillet from under it so that it is now sitting on the prongs of the cooker, in direct contact with the gas flame. Move it around so that it gets browned evenly (like in the picture on the right). At this point, the water inside it boils and the whole thing blows up like a breathalyser bag (unless you have any holes in it). This steam cooks the roti from the inside. When the surface of the underside looks like the image on the right, it is done and you put it to one side to cool down whilst you get on with the next one. 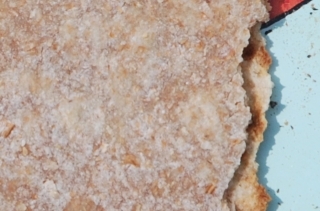 So now, we have a food product (that is never bad in computing circles), that has two interesting textures on it, has two layers that can be separated completely quite easily. For my requirement of having something that has been torn in half, that makes for an interesting shot. On the top-right, we have the second cooked face upwards and on the right, we have the side that was exposed to the flames - both torn in half. ... and here (right), the other side. It is then, just a matter of matching them up with the requirement for the image - in this case, the holes in the punched card should not fall over an edge - the column with the '4' of '274' has an upper-surface tear in it that goes below it in the same column but the hole misses it. This image was scaled so that it fitted properly. One thing to notice in the image on the right and the one above it (which was used in the final image on the left) is that where the upper layer of the roti casts a shadow, it has a larger displacement than the shadow cast by the lower layer. 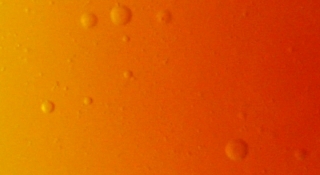 The images were taken in direct sunlight (to enhance the texture) so the shadows of both of them are sharp to the point where any extra blurring of the shadow is in the sub-pixel range but in the image on the left, the drop-shadows had different blur radii as well as displacements (in fact, they were done by hand). You are not limited to things that you can make yourself. 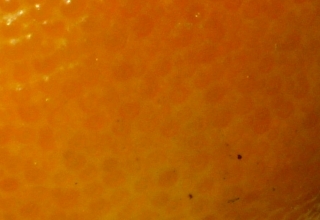 On the right is the surface of a small orange although many citrus fruits have a surface similar to this. 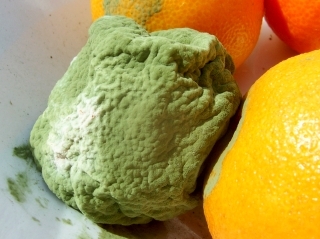 Here is a mouldy orange which has an interesting surface. 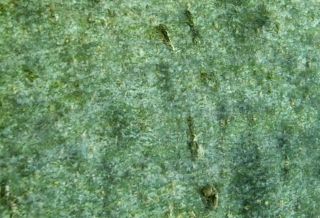 Note that the mould starts to bloom where it has been growing the longest. 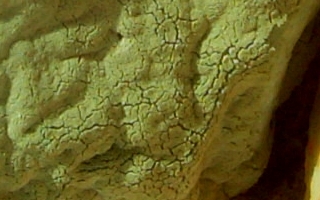 This is the texture of a part of the same image from above, showing the way the surface cracks. You can use this natural, surface-cracking in your images without having to reveal that it was actually mould that it came from. Last month's card came from a mouldy orange (yes, we eat oranges; yes we don't always get around to eating all of them). 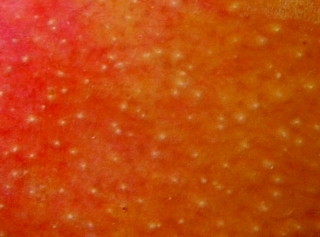 In this image, a bump map was derived from the image, rendered and then the highlights and shadows extracted (render it to a grey surface and then use the colour-to-alpha function to remove the grey). These were then added to the underlying layer so that it gave the right effect. The layer with the numbers on it had its alpha fixed and then colours from the mouldy layer were used to paint the numbers different colours according to the local background. The layered effect on the right, were the tear is, is completely fictitious. This one is of a mango. Fruit provide a very useful library of real-life textures - you can get what you want from most local supermarkets nowadays. Often, they provide translucent-looking surfaces and you can always mess around with the colours. You don't have to use raw fruit either. This is, of course, mango jam (a cup and a bit of sugar to a cup of mango pulp and then boil). The bubbles add an interesting texture to it. You are not limited to using fruit from trees either. This is ash tree bark and has a wonderful surface. Hopefully, this will give you some ideas and armed with a fairly cheap camera (a 4 Mega Pixel camera is adequate and doesn't cost too much), you can furnish your own texture library opportunistically. Carry the camera with you and when you see something interesting, take some pictures of it. Who knows when you will find them useful? There is of course a lot that you can do with artificial textures in images - it is just that if you use the pre-set textures, you are just going to end up with something that is rather derivative. On the right is the punched card from HelpDesk 272 which is produced entirely artificially, using pretty much the same set of procedures you are going to use below, except for the wave generated displacement (using the GIMP 2.4.1 and many before that, 'Filter'/ 'Map'/ 'Displace...' using a wave bump map to produce the refraction distortions and then just a normal 'Filter'/'Map'/'Bump Map...' to produce the reflections (colour to alpha) - you'll see how it works below). On the left is the punched card from HelpDesk 270 (apparently made from a piece of flint rich in crynoids) which again, is produced entirely artificially. I'll leave it as an exercise for the reader to work out how this was done. You are going to be better off doing it on your own but you do need to think about what you want and how you are going to achieve it. In other words, how do you make what the image processor is capable of work for you to produce what you need. Here, we will be using The GIMP 2.4.1 (happens to be on OpenSolaris so it is running on UNIX, not BSD, Linux, OS X or Windows but the interface is the same whichever OS you use) although what you will do here can be transferred to other images processors that use layers so it is not GIMP-only. The menu layout is the default so you should be able to reproduce this for any image you want to make. The theme used ('File'/ 'Preferences'/ 'Theme') is the small theme and for the toolbox in the same dialogue, make sure that Appearance has all three options ticked. If you click on 'File'/ Dialogues'/ 'Tools' (near to the bottom) you can add everything except 'Colourise' to get the same tool set as used here and just adjust the size of the window to get it looking the same. That way, it won't take up much room and you have most things you need for any job. So, what do we want here? We want to create a 'PC Plus' wallpaper that looks like a sand-cast block that has had the letters 'PC Plus' cast out of it (they stand out) which have then been honed down with a diamond tool to a flat surface. However, casting into sand is never a perfect job and you end up with bits of grit embedded in the surface which is also quite uneven. Thinking of this, we need to produce some proper noise that reflects the unevenness of a cast, flat surface, we need to be able to produce cast inclusions (bits of grit) and we need to be able to make letters stand out and then be ground flat. With what you will learn here, you can make a wallpaper any size you like but my screen is 1280x1024 so we'll start off by creating a blank canvas that is twice that size. Click on 'File'/ 'New' and in the image size, type in your screen size dimensions times two (this will give us a bit of extra space to play around with and the ability to reduce the image by a factor of up to two so that any unevenness can be ironed out). So, 2560x2048 it is. This gives us an image of 46.9MB and we'll use this to hold our bump maps and other parts of the image. Save it as myfile.xcf.gz and then, as you work, you can save it just by pressing [Ctrl][S]. Now, we need to create some noise so that we can have our cast background. There are a number of noise generators but rather than use a pre-set noise, we'll do this manually. We are going to create five binary scales of noise with the final scale being blown up by a linear (size rather than method) factor of four. So, we want to create a new image that is only 40x32. Click on the foreground colour in the toolbox and in the 'HTML notation:' field, type '7f7f7f' and press [Enter]. Click on 'OK'. Next, drag the foreground colour from the toolbox to the background image in the Layers dialogue box and drop it on it. This will flood-fill the image with mid-grey. Now, right-click, 'Filters'/ 'noise'/ 'RGB Noise'. Uncheck the 'Independent RGB' checkbox and adjust the sliders so that they say 0.50. Click on 'OK' and this will create an image with noise with values ranging from 0 to 255. Next, resize the image by right-clicking on the image and selecting 'Image'/ 'Scale image'. If, for the units, you click on 'percent', then change one of the image size values to 200.00 and when you go to the next field in the dialogue (say by pressing [Tab]), it will change the other as well (they are linked with the chain icon). The interpolation method should be set to 'Cubic' and then click on 'scale'. You can now see that the noise is a bit 'blurry'. Now, create a new layer in our 80x64 image by clicking on the new layer icon in the layers dialogue. For the 'Layer Fill Type', choose the 'Foreground Colour' (which is the mid-grey) and then click on 'OK'. We now have a new, mid-grey layer. Next, right-click on the image (the new layer is automatically selected) and select 'Filters'. At the top of the list is 'Repeat "RGB Noise"' and below that is 'Re-Show "RGB Noise"'. Re-showing it brings up the dialogue box again but we already have that set the way we want it so we can just use the Repeat menu item or, [Ctrl][F] (for Filter) without calling the menu. In the dialogue box, change the opacity of the layer we have just created to 50%. Resize again (so now it is 160x128). Now, you can create a new layer from the Layers dialogue box by holding down [Shift] and clicking on the new layer button. This gives you the last options used (foreground colour which happens, at the moment to be grey). Click on the image window and press [Ctrl][F] to generate the noise, in the layers dialogue, change the layers Opacity to 33.3%, resize the image window by 200% to 320x256. Create a new layer (Layers dialogue) [Shift]-click on New layer button, focus on image, press [Ctrl][F] for noise, in Layers dialogue, change opacity to 25%, focus on image, resize to 200% to 640x512. Create a new layer (Layers dialogue) [Shift]-click on New layer button, focus on image, press [Ctrl][F] for noise, in Layers dialogue, change opacity to 20%. Now, we have five layers, each contributing 20 percent to the final image. On the right, blown up by four in each case, the left half is normal noise and the right half is the noise we have just generated. Just in case you noticed that the density range is smaller on our generated noise and that might affect it, here it is (lower-right) with the density range stretched to the same extent, with a single layer of noise in the background for comparison. You can see that there are macro structures there, generated on various scales as you would get in reality, giving it a sort of clotted or flocculent look about it. Now, right-click on one of the layers in the Layers dialogue box and then choose 'Flatten Image'. Then scale it up by a factor of four to 2560x2048 pixels. Now, we need to blur it a bit so right-click on the image and select 'Filters'/ 'Blur'/ 'Gaussian Blur...' and adjust the blur so that it looks like there are no squarish corners to the noise - a blur radius of around 5 pixels will do this nicely. Next, drag our noise layer from the Layers dialogue box and drop it in our wallpaper image. This will make it have two layers, one of which is our noise. Next, we are going to create our text. Create a new layer in our wallpaper image by holding [Shift] and clicking on the new layer icon. Next, click on the white arrows to swap the foreground and background arrows over and then click on the text tool. Click on the image and type your text - we'll use 'PC Plus'. until you have what you want. Now, we want to make sure that it is centred in our wallpaper. The text layer is smaller than the background image so click on the 'Alignment' tool. Next, drag the mouse from top-left to bottom-right over the text layer (it could be any direction, just imagine that you are using the selection tool) and small pink blocks will appear in each corner of the layer. Now, make sure that 'Image' is selected in 'Relative to:' and then click on whatever alignment you want. If you want to move the layer just up or down or left or right, you can click on the move tool (the blue NSEW arrow icon next to it) and move the layer using the arrow keys instead of the mouse. Now that it is in the right place, drag it down to the bottom of the layer list - we can use it as an outline reference for many different tasks - just don't change it's x-y co-ordinates once it is in the right place. NOTE: Doing this is all right if you just want one block of text that you can type in in one go. If you want several pieces of text and perhaps a logo (on a transparent background), get them all in the right place and then merge them into one layer and move that to the bottom - here, we are just going to use this layer to create masks so its alpha values are the only important part of it. Make sure you end up with a transparent background with what you want as opaque. First of all, we're going to make a raised portion on our casting bump map that corresponds to the characters we've just typed in. Right-click on the text layer in the Layers dialogue box and then 'Alpha to Selection'. Next, click on our 'New Layer' (the grey one at the top). Now, grow the selection - say by 15 pixels - right-click, 'Select'/ 'Grow' and then change the value to 15 and click on 'OK'. This extends the sharp edge beyond the letters. Next, feather the selection - by twice the value we used above - right-click, 'Select'/ 'Feather' and then change the value to 30 and click on 'OK'. Then, drag the white colour from the toolbox and drop it onto the image to flood-fill the selected area. Next, press [Ctrl][Shift][A] to remove the mask. Then, in the Layer's dialogue box, double-click on the label for that layer and type in 'bump'. Whilst you are at it, change our noise layer's name to 'noise'. You don't have to do this because it won't change the way any of it works, it's just that it can get a bit confusing if you have seven layers called 'New Layer'. Next, create a new transparent layer by just clicking on the new layer button and selecting transparency as the layer fill type. Then, right-click on the text layer in the Layers dialogue box and then 'Alpha to Selection' as you did in the previous step. Click on our 'New Layer' (the transparent one at the top). If you drag the white into that layer and drop it, you can see that our letters stand out from the gradient a bit (such as at the top of the 'P' - right) which is pretty much what we want, but, at the bottom of the top of the 'C' where it is close to the 'P', the white letter juts out too much. In a real casting, it wouldn't be like that so we'll repeat what we did above but with a smaller grow and feather. First of all, let's back-track to where we had the alpha on the transparent layer. You can either press [Ctrl][Z] to step back or, you can click on the 'History' dialogue which is in the layers dialogue box. This shows you what you have done and if you go back too far, it will let you go forward again (as will using the key method, it's just that this is easier to see). We need to go back to where we had just selected 'Alpha to Selection' so click on that. Next, click on the layers tab. Now, grow the selection - say by 5 pixels - in the image window, right-click, 'Select'/ 'Grow' and then change the value to 5 and click on 'OK'. This extends the sharp edge beyond the letters. Next, feather the selection - by twice the value we used above - right-click, 'Select'/ 'Feather' and then change the value to 10 and click on 'OK'. Next, press [Ctrl][Shift][A] to remove the mask and change it's opacity (in the layers dialogue box) to around 20 percent. Finally, create a layer that will be our honed surface. Create a new, transparent layer, get the alpha from the text layer, select the new layer and then drag white from the toolbox into the image, finally getting rid of the mask using [Ctrl][A]. Now change our 'bump' layer's opacity to around 80 percent. This will let the noise through to give us our mottled bump map. However, if you look at it, it has a fairly even distribution but castings into sand aren't quite like that. We need to change the noise's density distribution to reflect what we want from our bump map. The first rule is don't destroy what you have so, in the layers dialogue, with the noise layer selected, press the duplicate layer button and move our original to the bottom. This way we can re-do any work that we might mess up later on. Now, we can work on the copy safely. Click on the curves tool icon in the toolbox and then with the 'noise copy' layer selected, click on the image. We can now change the density and tweak its profile. With this set, click on OK.
Now, we want to create the casting inclusions (bits of grit and so on that ruin the surface - a bit like those little black bits of old chips you get in the chip pan that stick to your chips). Make a copy of the noise layer and drag it to the top. We effectively want to make a mask of where these inclusions have indented the surface so let's use the threshold tool. Make the new (top) noise layer have a opacity of around 50% or so, so that we can see what is underneath and select the threshold tool. Click on the new layer and then adjust the lower value until we have the right amount of inclusion - here it was 185. Click on OK.
Repeat the exercise (fresh copy of the noise layer on top, make partially transparent and then hit the threshold) but this time, leaving a smaller sized mark. Imagine a piece of grit, sitting in its own indentation. Click on OK and we now have our two new masks. First of all, let's deal with the indentation mask. Make that the current layer. Then, blur it by right-clicking, 'Filters'/ 'Blur'/ 'Gaussian Blur...' and then choosing a value that gives a reasonable slope - I used 15 pixels radius. Select RLE to speed things up and then click on 'OK'. Next, we want to remove the background so we right-click on the image and then 'Colours'/ 'Colour to Alpha'. Click on the 'From:' colour button, then on the dropper and then on the black part of the image. Click on OK in the colour selector and then on 'OK' in the colour to alpha dialogue box. We now have our mask but the colour is wrong. Click on the 'Lock Alpha Channel' checkbox in the layers dialogue box then click on the little black and white reset on the foreground/background selector in the toolbox. Drag the black onto the layer in the layers dialogue box or into the image itself. to flood-fill that layer whilst preserving the alpha. Adjust the layer's opacity to around 30% to give the indentations in the surface, including the letters that have been cast. blur it with a radius of around 2 pixels so that the blocky edges disappear. You can now see what we have on the right and on the left, you can see what our layer structure looks like..
We are almost done. ... Well, sort of. Next, we need to create the mask for our honed letters. This is fairly easy. Make a copy of the text top layer - this has the crisp letters with a transparent background. Make a copy of the dents layer - this has the modified densities in it. Bring them both to the top (with the dents copy layer on the top) and make them both 100% opaque. You can, beneath them - in the layer hierarchy - create a black layer so that you can see what you are doing easier but you don't have to (we'll only delete that extra layer later if we do make it). Next, make our copied text layer the current layer and right-click on it in the Layers dialogue box, choosing 'Alpha to Selection'. Press [Ctrl][I] to invert the mask, make the dents copy the current layer and then press [Ctrl][X] to cut away the dents that are not part of the honed text. Now, right-click on the clipped dents copy layer in the Layers dialogue box and select 'Merge Down'. Rename the layer something like 'honed text'. Then, right-click on the image and select 'Colours'/ Colour to Alpha' and make sure that you have black selected as the colour. Click on 'OK'. Next, select the curves tool from the toolbox and click on the image. Select 'Alpha' as the channel (top-left) and 'Freehand' as the curve type (bottom-right). Next, click on the graph and drag all but the 255 value (horizontally) to 0 (vertically). To make this easier, you can make the window wider and the scale will stretch for you, allowing you to use more precision. Next, we want to make our honed layer. This is essentially a surface that has been machined with a very sharp tool so that it shines. Make the foreground colour '7f7f7f'. Create a new image that is just over a 10th of the width of the final image and a little bit taller so as ours is 1280x1024, well make one that is 130x1030 pixels and make it the foreground colour ('Advanced Options', Fill with:' 'Foreground colour'). Click on 'OK'. Right-click on the image and select 'Filters'/ 'Noise'/ 'RGB noise...'. Make sure that the sliders are not independent and the value is 0.50 then click on 'OK'. Right-click on the image and select 'Image'/ 'Scale Image...'. Break the chain and make sure that the width is 200 percent and the height is 100 percent. Click on 'OK'. Click on new layer, select foreground, set opacity to 50%, press [Ctrl][F] for noise, scale to 200/100 percent, click on new layer, select foreground, set opacity to 33.3%, press [Ctrl][F] for noise, scale to 200/100 percent. Now, we have noise that is stretched horizontally. Flatten the image and then scale it so that it is just a bit bigger than our working required height (ie, by 200% so it is now 4160x2060). Next, right-click on the image and select 'Filters'/ 'Blur'/ 'Motion Blur...'. Make the blur type 'linear', the angle '0' and the length 200 or so. Click on 'OK' and go and make yourself something to eat or drink. Next, click on the curves tool and then on the image to make the density range full range (40-210 ish) and click on 'OK'. Then, click on the Duplicate layer button in the layers dialogue and set the opacity of the new layer to 50.0%. Next, on the image, right-click and select 'Colours'/ 'Invert' - it should all go grey. Next, click on the Move tool (the blue NSEW arrows) and then on the image window (but not on the image - try the title bar). Now, move the image upwards by pressing the up key on the keyboard two or three times. Flatten the image and then drag it into our wallpaper image (which should be zoomed out completely so that all of the image can be seen so that the dropped image covers all of the wallpaper image). Right-click on the new layer in the Layers dialogue and select 'Layer to Image Size'. Rename the layer 'honing' or similar, make a copy of it and drag the honing layer down to the bottom where the noise and the PC Plus text layer (or your other image layers) are. Right-click on the 'honed text' layer and select 'Alpha to Selection'. In the layers dialogue, make the honing copy the current layer and then click on the border of the wallpaper image so that it has the focus. Press [Ctrl][I] to invert the selection and then [Ctrl][X] to remove the unwanted honing. Finally, drag the '7f7f7f' colour from the toolbox and drop it into the layer called 'Background'. Save it, if you haven't already done so. One thing that is worth taking note of here is that all of the layers (apart from our text layer) are the full size which means that we can create new layers and drag and drop them. When we drop them back into this image, they will be aligned. So, running at 826MB of RAM (or so), press [Ctrl][D] to duplicate the image (the new image will be smaller because there is no history to remember - this one came in at 250MB but this depends on the detail you have in your layers). In the new copy, turn off the 'honing copy', 'honed text' and 'grit' layers. Change the opacity of the bump layer and merge down the 'text local blur' layer (the one with the small blur radius and the opacity of around 20 percent) with the bump layer and then apply curves to the alpha so that the appearance is more spherical (in a Turin Shroud sort of way - this is essentially what a bump map is). Next, adjust any opacity levels (such as the bump layer opacity) you want and flatten the image. Then, drag and drop it into the wallpaper image and rename it 'bumpmap'. Drag the background layer to the top. Next, right-click on the image and select 'Filters'/ 'Map'/ 'Bump Map...'. Make sure that you have the right layer as the bumpmap and then mess around with the controls until you have something that you like. 'Depth:' - the higher this value, the more effect although we want a lot here. Once you are satisfied, click on 'OK' and let it render (it is fairly fast). Then blur it (right-click on the image, 'Filters'/ 'Blur'/ 'Gaussian Blur...') by around 5 pixels radius so that there is nothing that is too fine and any contours that might have been have been smudged out. Next, in the Layers dialogue box, drag the honing copy layer (the cut-out text) to the top. Select the curves tool and push the density range up so that it looks like machined metal. Now, move the grit layer to the top. This is still white so in the layers dialogue, lock the opacity, in the tools dialogue, make the colours black and white and then drag the black down to the grit layer (either in the layers dialogue or on the image). Finally, you can select the background layer and click on that to adjust its density so that you might have highlights clipped and the midrange squashed to give it a more matt appearance - whatever you want. You can adjust the densities of the RGB layers independently to give the metal a slight colour. You can also, take the honed copy and duplicate that. Preserve the opacity and then drag a gradient (such as the horizon gradient) over it then adjust its opacity to whatever you feel it needs to be. You can also give your grit a 3D appearance and give it a drop-shadow if you want. Finally (yes, really), flatten the image (or a copy of it) and then size it down to your screensize (or scale it as appropriate and then crop it). When you scale it down, you are effecting an oversampling. This is what we've just made and having preserved the layers that take the time to make (the noise and the brushing) we can modify it or make completely new ones fairly easily. Finding the current content of a remote file every couple of seconds will hammer your server's log file, burying your normal traffic in thousands of lines of repeated requests. One solution is to use a server that doesn't write a log and, so that it doesn't conflict with your existing server, uses something other than port 80. Ideally, you need something that can look at a browser's (or browser-like program's) request and feed it what is needed. In this case, we'll look at using a port to get one specific file. In the screenshot on the right, there are a number of lines including one specifying the file, eventually followed by a blank line. After that, we send the file that has been requested. Here, it is not even a HTML file, just a number (to keep a web counter display up-to-date). We'll use xinetd to run the server which means that our program is only called when xinetd receives a call on that port so all we have to do is write something that will read from STDIN and write to STDOUT. So first of all, we we need to open up /etc/services and add a line for our service in a suitable, unused range. This means that when xinetd starts up initially, it can find what it has been told to look for and allocate a port to it. # below matches the one you chose. In the file, we tell xinetd where the server is and what it is called, along with the IP address to bind to (in the example above we have used 1.2.3.4 so substitute that with your server's address such as 192.168.12.254 or 10.1.25.254) and the port number. This matches with the entry in /etc/services. # we are only going to serve it with one file anyway. # aka... "talk to the hand cos the face ain't listening"
# Read the file - substitute your own here, it can be anywhere. When you are writing a program, the last thing you want to do is to re-invent the wheel. If you can call a program that already does the job for you, then you can save on making errors, introducing security flaws and so on. Getting a file from a web server and storing it locally calls out for 'wget'. If you want to use a port other than port 80 (HTTP) then all you have to do is to tell it which port on the command line, in pretty much the same way that you would in the address bar of a browser. The switches we need are '-q' to turn of wget's command line output and '-r' makes it retrieve recursively although it has the effect here that it overwrites the current file with the new one (there is no recursion to do). Also notice that the file is stored in a directory with the file name of the IP address and the port number of the server so when you come to open the file, remember that it has this extra part to its path. Substitute your own serial location for your system - see Opening a serial port above. So, you can see that it polls the server every two seconds. If the value it receives is different, it posts that to the serial port. If it is the same, it does not. After 20 seconds, if there has been no change, it posts a 't' to the serial port which makes the display show the current time. If the value - which is still polled every two seconds - has still not changed then it goes back to showing the last counter value that it was given although this time, it also displays leading zeros. If, at any time, the polled value changes, it displays that and the 20 seconds starts again. On the issue 273 SuperDisc, I showed you how to make letters using gradients in 'Mango Jam - Hello World'. If you click on the icon on the left, you will open up in a new window, the directory with the set of letters below. The display is from Gnome which, like many other browsers, makes all of the images the same maximum height/width so on the second row, the 'n' seems bigger than then 'l' and the 'm' - in reality, they are all done using the same font size.